Born in 1944 and brought up in South Africa by his mother. His father, a commander of the Royal Scots Greys, had died during the war. He was educated at Eton, and started out on a military career, serving for eight years in the British army. Although he was expelled from the SAS for his involvement in a piece of environmental activism, he saw active service in the Dhofar Rebellion in Oman and was decorated for bravery by the Sultan of Oman. However, Fiennes soon discovered that his true vocation was as an explorer and he received much support in this from his wife, Virginia (Ginny), whom he married in 1970. Ginny was the first woman to receive the Polar Medal due to her role in the Transglobe Expedition 1979-82. Ginny died in 2004, after which Fiennes married, Louise Millington, with whom he has a daughter, Elizabeth, born 2006. Among his early adventures were an expedition up the White Nile on a hovercraft in 1969, and a journey across British Columbia by canoe in 1971. Between 1979 and 1982, he led the Transglobe expedition, during which he and his co-partner Charles Burton became the first people to reach both North and South Poles overland. However, his attempt to reach the North Pole unsupported, an expedition lasting between 1986 and 1990, was sadly unsuccessful and involved Fiennes in a dispute that would do some damage to his reputation. Fiennes criticised his rival, the Norwegian Erling Kagge, for claiming success in this mission despite the fact that one of the Norwegian’s team (Fiennes claimed) had received medical help during the expedition. 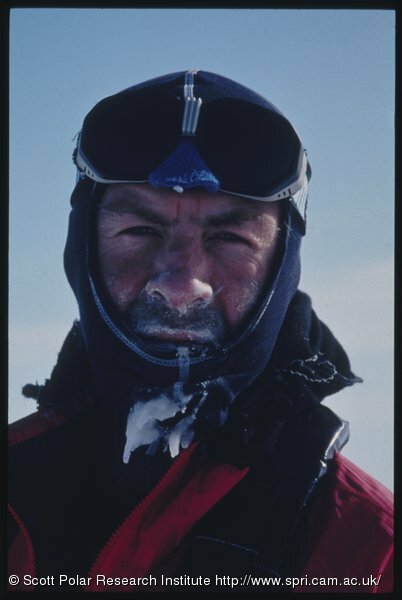 Undeterred, Fiennes attempted, in 1993, to reach Antarctica unaided, but he and his companion Mike Stroud were forced to call for help, frostbitten and starving, after crossing the continent in 90 days. In 2000, backed by Excel Logistics, he again attempted to walk unsupported to the North Pole, this time solo, but was forced to turn back when he suffered severe frostbite. As a result of this, he lost the fingertips of his left hand. In recognition of his achievements, Fiennes was awarded the OBE in 1993 and the Polar Medal in 1995. He has also enjoyed success as the author of many books, including memoirs, fiction and a biography of polar explorer Robert Falcon Scott. In addition to his polar expeditions, Fiennes has undertaken a variety of challenges, often to raise money for charitable causes. For example, in 2003 he completed seven marathons in seven days to raise money for the British Heart Foundation. See the images that Ranulph Fiennes chose for his Freeze Frame gallery. Fiennes, Sir R. (2007) Mad, Bad and Dangerous to Know. Hodder & Stoughton Ltd.
Fiennes, Sir R. (2006) Living Dangerously. Long Riders’ Guild Press. Fiennes, Sir R. (1983) To the Ends of the Earth. The Transglobe Expedition 1979-82. This entry was posted on Thursday, November 6th, 2008 at 6:04 pm	and is filed under Biographies, Fiennes Sir Ranulph, Resources. You can follow any responses to this entry through the RSS 2.0 feed. Both comments and pings are currently closed.